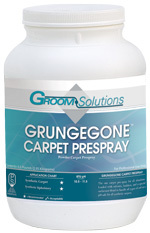 Grungegone Carpet Prespray is a complete, ultra-concentrated, high alkaline preconditioning formula for carpets and upholstery. Grease and oils dissolve in minutes while protein soils are digested and readied for complete extraction. It is excellent in restaurants and on problem soils found in homes and apartments. It is serious cleaning power for grungy soiling. Alkaline resistant dual action enzymes break down and digest protein soils, grease, and more. Grungegone starts to work on contact with its fast striking action. Grungegone contains encapsulated enzymes that stabilize the formula and keep it fresh and ready, even when stored for longer periods. Grungegone is safer for the environment and safer for the user than other high powered cleaners because it contains no butyls or other harsh solvents. Grungegone is economical and dissolves quickly , suitable for use in the Hydorforce sprayer. Ready to use, it costs you only pennies per diluted gallon. For best results, mix with hot water, up to 150 degrees. For maximum cleaning results, diluted solution should be used within 24 hours. Brief exposure to high temperatures through the Hydro- Force will not effect performance. • For heavy soil, mix 3 oz. Grungegone in 1 gallon hot water. • For moderate to heavy soil, mix 1-2 oz. of Grungegone per gallon hot water. • For use in the HYDRO-FORCE injection sprayer, mix 12 oz. Grungegone in 5 quarts hot water. Use standard 1:8 mixing tip. Spray ready to use mixture evenly on the carpet. Allow up to 15 minutes before extracting. Do not allow solution to dry on the carpet before extracting. ALWAYS PRETEST FOR COLOR FASTNESS OR COLOR CHANGE. Use only on wet-cleanable upholstery. Mix 1 to 2 ounces Grungegone in 1 gallon hot water. Spray lightly over soiled areas. Allow to dwell for 5 minutes. Proceed with proper extraction.